Your worst nightmare as an Amazon seller has happened. You’ve received that dreaded notification from Amazon saying one of your products, or your entire account, has been suspended. In order to get reinstated, you need to show Amazon a complete plan that will work, and that you can implement. BUT… they won’t give you any feedback on what you need to do. They only approve/disapprove what you’ve already done. Experienced and ready to help. At Cascadia Seller Solutions, we know Amazon expects “immediate and aggressive” action to resolve the issues you face. How do we know? Because we’re former Amazon employees, having spent 60 cumulative years in such areas as Compliance, Customer Service, Product Development, and Seller Support. We write the content to help Amazon understand your point of view, and we are tenacious in getting eyes on your appeal. Our team may not always be successful, but we exhaust all options every time, even when success isn’t guaranteed. 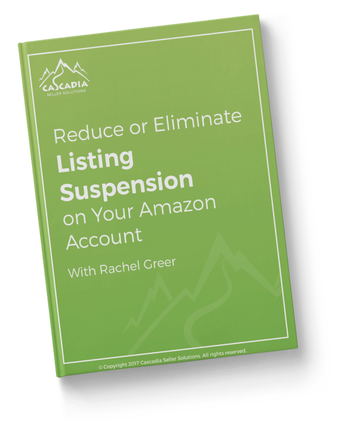 Our Amazon experience enables us to understand how to help you fix the root cause and prevent future listing suspensions. My biggest concern before hiring Cascadia for reinstatement work was whether or not the value would be there and it definitely was! They were available to answer my questions quickly and was knowledgeable and caring throughout the process, offering clarity on next steps. For anybody considering using their services, I would say, “HIRE THEM!” They have the experience from working at Amazon and they basically write the email responses for you. Decide you want to work with us (great choice!). Then purchase your reinstatement service below. You will receive an acknowledgement of your case within 4 business hours of sign-up, Monday through Friday, 9am-6pm PT. We will advise on next steps to get moving in the right direction, and keep you updated with our findings as the path forward becomes more clear. We then provide you with our honest assessment regarding your reinstatement options and use our research to create a corrective draft Plan of Action for Amazon. No matter how tough your case may seem, we always give our best efforts. When my Seller account was suspended, I was worried that I would be spending a lot of money for something that would not really help. Instead, Emily and the team at Cascadia delivered and got me back to making money on Amazon again! There is a real benefit to hiring expert help when you’re in crisis and Cascadia is definitely that. I even hired them afterward on a monthly basis to keep my account healthy; they are worth every cent and I am happy to pay them. We’ve handled product safety investigation takedowns for lead in children’s products, a food safety takedown of an entire brand, restricted product claims and ingredient reviews for supplements, fine jewelry applications and suspension reviews, and regulatory compliance investigations in the EU. Since many of our team members came from Amazon Compliance, where non-standard seller suspensions tend to originate, we are best positioned to help you solve these issues. Our current reinstatement rate is 91%. We don’t artificially inflate our rates to make ourselves look better, and we regularly take on difficult cases. You will always receive our honest assessment, every step of the way. As business stakeholders or owners, when Amazon suspends one product listing that your company’s livelihood depends on, your heart skips a beat. Moreover, the notices & messages Amazon sends regarding the suspensions are notoriously & woefully cryptic, at best. This is where we’ve found solace by turning to Cascadia, our relationship counselor with Amazon. They helped us decode Amazon’s enigmatic messages, understand their perspective, concoct a plan of escalating action to be executed even through the weekend, with a “whatever it takes” attitude. And because of that, anywhere between a matter of days to a couple of weeks, in return Amazon forgave us, and welcomed us back with open arms. We owe our continued business continuity to Cascadia. Choose which type of Listing Reinstatement you need. After selling on Amazon for 4+ years, I thought I knew how to speak to Amazon and I wasn't sure how Cascadia could help us getting our listing back. But thankfully they did an amazing job and really know the "language of Amazon" at a deep level. It was fantastic to speak with them and start to understand what Amazon truly wants and needs to hear from us in these situations. They saved the day! If you have any compliance or performance issues with Amazon, definitely contact Cascadia! We had actually done nothing wrong but I'm really not sure we would have ever got our listing back without Cascadia's help. Well worth the investment! Choose how quickly you need your Amazon account back. For the first time in our three-year selling career, we had a product suspended. We noticed Amazon cracking down on sellers and also noticed the black hat competitors were getting more creative with their attacks. When you have one chance to clear up your account, you have to make sure it’s right. If you don’t do a good job, you can be banned from selling that SKU. That was terrifying. We heard back from the Performance team within a few hours of submitting the proposal and were back selling. A huge relief!